King Tut Mummy - Why did the Ancient Egyptians create Mummies? The mummy of King Tut was found in the tomb of Tutankhamun. The tomb contained four gilded shrines nested one inside the other in order of decreasing size. Inside the innermost shrine was a red quartzite sarcophagus which protected three anthropoid coffins (man-shaped). The first two coffins were made of gilded wood but the final coffin was made of solid gold. The solid gold coffin housed the mummy of King Tut and his fabulous golden death mask. The death mask had been placed directly over the mummy of King Tut. This page describes the King Tut Mummy. The Ancient Egyptians believed that every person was thought to have three souls - the Ka, the Ba and the Akh. These three elements of the soul, were believed to be perishable and therefore at great risk. The Ancient Egyptians believed that tomb of Tutankhamun, the process of mummification and the rituals and magic spells which surrounded it would ensure the preservation of the Ka, Ba and Ahk of the King Tut. The objective of mummification was therefore carried out to keep the soul alive and ensure a clear path to the Afterlife. Mummification was the process of preserving and embalming a dead body in the belief that the body would be necessary in the Ancient Egyptian afterlife. Using a special and ritualised process the Ancient Egyptians removed all moisture from the body which left a dried form that would not easily decay. The mummification process for King Tut would have taken 70 days. This period of time was divided into 15 days for cleansing and purification of the body, 40 days drying period and finally 15 days for wrapping, bandaging and paintings. A hook was inserted into the nostrils and through the nose which punctured the brain and the brain fluid was drained out of the corpse of Tutankhamun. Incisions were made into the body and the stomach, liver, lungs and intestines were removed and stored in special alabaster containers called canopic jars - which were buried with the King Tut mummy. The heart of Tutankhamun was left in the body as the Ancient Egyptians believed the heart would be needed on the Day of Judgement. The body cavity was then packed with linen or straw soaked with oils, scents, spices, herbs and resins and then sewn together. The body of King Tut was then turned into a mummy being covered with layers with linen shrouds and bandages. Between the layers of bandages gold amulets and jewelry were added - no less than 143 separate items were wrapped with the mummy of King Tut. A heart scarab amulet was placed over his chest to ensure that his heart would not bear witness against him in Hall of Two Truths where their actions in their mortal lives would be examined before they could enter the Afterlife. The royal mummy of Tutankhamun was discovered, completely untouched, by Howard Carter. In 1925 the solid gold coffin was opened revealing the mummy of Tutankhamun. King Tut had been dead for over 3,300 years. The liquid resins which had been used during the mummification process had created significant damage to the King Tut mummy. The linen wrappings of the mummy could not be easily unwrapped and to enable the mummy to be investigated it was cut into various pieces. The body was cut in half, the arms and legs were detached and the head was severed. 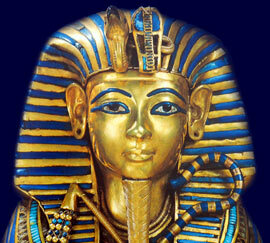 The golden mask was removed from the King Tut mummy by using hot knives to loosen the resin. Howard Carter and his team found 143 precious items on the mummy which included 15 rings on his fingers, 13 bracelets, the heart scarab, amulets, collars, daggers and earrings. The initial autopsy on the mummy found that King Tut had been about 5 feet 6 inches tall, of slender build and that he had died when he was 18/19 years of age. In 1968 a group from the University of Liverpool took X-Rays of the mummy which revealed a dense spot at the lower back of the skull. In 1978 a group from the University of Michigan X RAY and examine the mummy. These examinations and investigations led to speculation that the young boy king, Pharaoh Tutankhamun, had died from a blow to the back of the head and had been murdered. This changed in 2005 when a team of Egyptian scientists led by Dr. Zahi Hawass, the Secretary General of the Egyptian Supreme Council of Antiquities, conducted a CT scan on the King Tut mummy revealing that the skull injury was likely to have been caused during the embalming process. Damage to the left thighbone also suggested that Tutankhamun badly broke his leg before he died, and his leg had become badly infected.